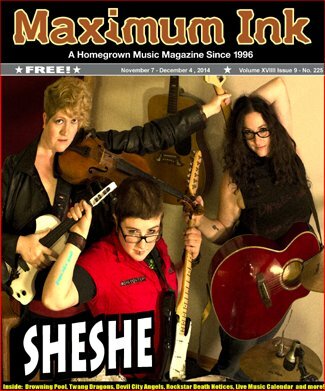 Maximum Ink: What is making SHESHE, and the band’s new music, work for you? Julia McConahay: Music is what makes sense to me. I’ve never known life without it, so it’s never really been a choice, more like a way of being. It’s how I’m identified most of the time. People have always asked me to come jam with them, or sit in for a set, record on their album, or join their tour. It’s an honor and a joy, all at the same time. Dana Perry: I really can’t see myself doing anything else with my life other than making music. I love how SHESHE has come together to make such bitchin’ noises together! I’m proud of the gigs and festivals we’ve played (Steel Bridge Song Festival, Ragged Roots Festival, Atwood Fest, the Bubble Festival, to name a few), and I’m proud of how we consistently have fun, but especially proud of us for working together to get this album out. Shannon Callaway: I feel as though music has been my back bone through everything. It’s more than a purpose, it’s just there. I pretty much consider my stylings to be hand in hand with my emotions. If I’m pissed off, I’ll drop that E string down and rage. If I feel light as a feather and have a smile on my face, I’ll tap dance on my drumset. MI: How did SHESHE get started? JM: I started SHESHE as an acoustic duo with Leah Brooke Conway (now of Elk’s Teeth and Rabbit’s Feet) whom I love dearly! After a few months, Dana Perry and Amada Marquez (Inferno Nightclub) caught the SHESHE fever and we grew into a four-piece band. Life happened and both Leah and Amada moved out of town, so Dana and I pressed on with our bad selves as a duo. Soon after, we saw a little glimmer from behind a closet door and we learned her name was Shannon Callaway! She’d been writing music with Meghan Rose and was interested in developing her drumming skills, so we busted that door open and ka-pow! The SHESHE three-piece was born. MI: But SHESHE isn’t all you do? JM: My natural wellness hair and body studio (Chrysalis Hair and Body) has been open for a year. Chrysalis is available by appointment, which makes it a win-win for me and my clients because the schedule is really flexible. This makes it possible for me to book live gigs and keep things running at my Deerwood Studios. I can even book tours now which is something I could never do when I was working for someone else! It seems like all of the big life pieces are finally sliding into place! DP: Besides playing with SHESHE and throwing down the occasional solo performace, I teach guitar and coach bands for Madison Girls/Ladies Rock Camp (wahoo!! ), and I teach private in-home guitar lessons. I’m also the Music Director for the Froth House (I do all the booking, promotions, host the open mics, etc). Personally, my own music-making (solo and with SHESHE), will always be at the forefront of my life, it will always be given the biggest focus. As long as I stay true to my music and what I want out of this life, everything else will just sort of naturally balance itself out. SC: The balancing act is definitely real. Mom always said life gets tough so choose wisely what you’re willing to burn yourself out for. Plus, other obligations come and go. SHESHE is a choice I have not once regretted. MI: You are working on the first SHESHE album. Can you tell me about the process, and what we can expect from it? JM: Three words… the SHESHE sleepover. We love the process. It is amazing to have our own recording studio because we can block off a couple of days in a row and record straight through the night. We take the time to spend together as people, not just musicians. We have become sisters in the process and we relate as such. There are so many moments of joy and celebration, and equally important times of needing support from each other. We’re not afraid to be honest, and it helps us thrive together. This album is a true reflection of the three of us as humans. Its not a chick-singer album, its not a girl-power project. We come from very different personal backgrounds, and have individually been through lots of learning experiences. Our songs explore it in a way listeners can relate and perhaps find some inspiration or solace. It’s kind of like a tool-box for the soul. DP: I have felt a little bit of stress during the recording process, but it’s natural. Every musician wants their album to be the best it can possibly be, and when you’re working together with your band mates and throwing all of your creativity into one pot, it can feel overwhelming sometimes - like there simply isn’t enough time and space in the world to fit in EVERY idea we come up with. It’s been a lot of fun though, and we’re really excited to finally have something to share with people who want to take our music home with them. It’s being recorded at Julia’s in-home studio (Deerwood Studios), and we’re doing all of the recording/producing ourselves, I’m really proud of how the new album is shaping up. We’ve got songs on there written by each of us, and all together it’s going to make one sweet CD! SC: The recording process is motivation enough. WE are doing it completely by ourselves. It’s the most stressful and powerful freedom I’ve had in awhile. Cause girls are awesome. Duh. MI: And with your new CD set to be released, what’s next for SHESHE? JM: Even though SHESHE is a fairly young band, the energy surrounding it feels like a buzz, and we can’t get enough! We are going to start recording our next album as soon as TEXTBOOK DELUSIONAL is complete, and are excited about booking tours with other amazing artists from Madison to take the SHESHE show on the road! DP: We’re also talking about the potential of having another member or two join us (we have a select couple of righteous gals in mind, already). We’re going to be working on new songs, and we’re working on tightening our sound and our flow as a band. I would definitely like to tour, collaborate with other bands, and generally just see what could happen if we keep up our momentum. MI: What is something people may be surprised to learn about you? JM: I LOVE to play Euchre. I could stay up all night laughing and playing cards. SC: Roast beef gives me night terrors. Seriously, I’m not even joking. SHESHE plays November 9, 2014 at High Noon Saloon with Eli August and the Abandoned Buildings. SHESHE new CD release party is December 5, 2014 at the Inferno and includes Lazydeadpoet, Meghan Rose, Annabel Lee, plus burlesque and comedy performances by La Bomba Waters and Sarah Connor of Les Cougars. $10 cover (pay $15 and get a CD at the door! ).